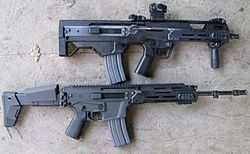 An assault rifle is a rifle that uses an intermediate cartridge, a detachable magazine, and can switch between semi-automatic/fully automatic fire. 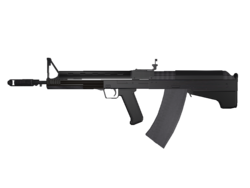 Assault rifles are currently the standard service rifles in most modern armies. It should have an effective range of at least 300 metres (330 yards). Several of the rifles on the below list have non-Assault Rifle variants. Because they lack the selective fire capability as they only fire semi-automatic even though it fulfils the other requirements of the definition above. ^ Taylor, C. The Fighting Rifle: A Complete Study of the Rifle in Combat. ISBN 0-87947-308-8. ^ Moyer, F.A. Special Forces Foreign Weapons Handbook. ISBN 0-87364-009-8. ^ Scroggie, R.J.; Moyer, Frank A. Special Forces Combat Firing Techniques. ISBN 0-87364-010-1.